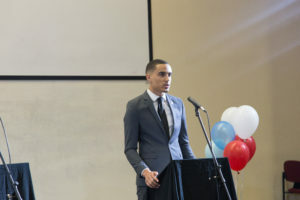 Georgia State’s Student Government Association (SGA) held its Senator debates on Thursday, March 30. 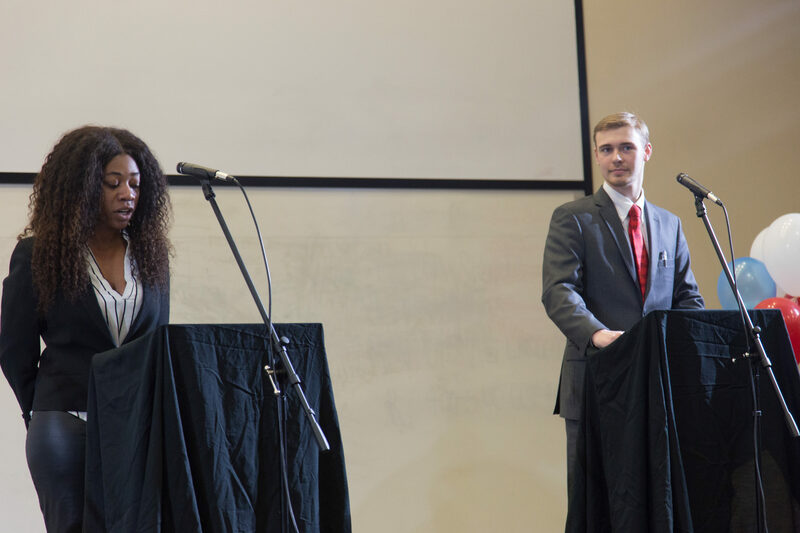 Hosted by SGA’s Election Commission and The Signal, the debates consisted of 23 senator candidates from Georgia State’s six colleges for the 2017-2018 school year. The colleges included in the debates were the Andrew Young School of Public Policy Studies, the College of Arts and Sciences, the College of Arts, the College of Education and Human Development, the Robinson College of Business and the School of Public Health. Each candidate was questions about how they would educate students about SGA, what issues they would tackle as Senator and what bills and resolutions they would present. The Andrew Young School of Public Policy holds three candidates, Brandon Cain, Ned Dagenhard and Chisom Enujioke. When asked how they would educate the student body about SGA, each student mentioned some form of outreach such as email, social media or going from class to class. 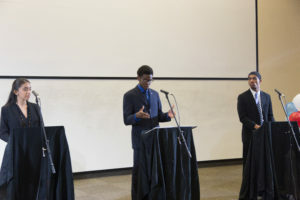 SGA Senate Candidate Nashbi Grand-Jean (middle) from the College of Arts & Sciences his platform that focuses on “spirit, belief, unity, productivity and a concentration on service,” at the 2017 SGA Debates, March 30. Candidate Cain said that outreach to Georgia State’s non-traditional students is a great way to increase the student participation on campus. Previous senator for the Decatur campus, Enujioke, said that while outreach is a great way to educate students, making those students feel comfortable and important is what matters. “Being able to connect and being approachable, so that students are not intimidated or scared to ask you questions is what makes students feel like they are being heard,” said Enujioke. The senators also made their way through the campus’ heated issues, navigating through the steps they’d take to address similar concerns if they came up in the future. Dagenhard brought up President Becker’s refusal to sign a Community Benefits Agreement (CBA), saying that one of his goals is to let it be known that Georgia State does care about the community around it. The College of Business contains five Senator candidates, Jonathan Jones, Elizabeth Plasencia, Taylor Patton, Joshua King and Rashad Siam. When asked how they would increase the SGA student body and participation, Plasencia said she would eliminate the mass emails and find a more personal way of informing students. at the 2017 SGA Debates, March 30. However, Jones felt like mass emails were more effective when it came to keeping the senate more transparent. When asked to present an issue within the College of Business, Patton said she found it difficult to connect with her fellow classmates. Siam said these connections cannot be made without the increase of opportunities presented on campus. “I will use my communication and networking skills to bring more opportunities on campus by going to each campus and speaking,” said Siam. School of Public Health candidate, Erica Aibangbee agreed with starting a small club or organization in order to better get to know those in her college. The College of Arts and Sciences holds 13 candidates, Noah Samuelson, Jessica Siemer, Alexander Lloyd, Luis Aleman, David Osilaja, Ana Collantes, Austin Birchell, Alondra Hernandez, Nashbi Grand-Jean, Anthony Jones, Fatourmata Barry, Antrell Vining and Juan Galvis. When asked how they would reach out to diverse groups on campus, Siemer suggested that the authoring of bills should be done by a campus, rather than a select group. While Siemer suggested a solution to reach out to diverse groups, Collantes suggested a way to aid the university’s underrepresented groups. “More internships opportunities and networking events could fix this problem,” said Collantes. The debate moderators brought up the topic of unity and methods to implement this concept on campus. Grand-Jean said he would bridge the gap between spotlight, the student body and SGA. A widely known campus topic is the gender neutral restrooms issue. Galvis said that is one of his main initiatives. Voting for SGA Senators opens today, and will run until April 6. For more info, visit sga.gsu.edu.